In the elder times, before the dawn of man or even the first birth of elves, an ancient civilization was widely distributed across the world. Now they are long gone, but they left behind a lethal legacy. Their tombs and ruins are filled with the deadliest of traps, many using techno-magical powers not understood by modern scholars. 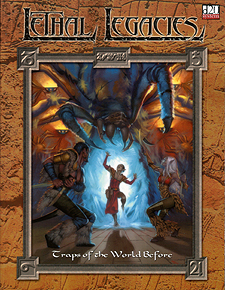 This handbook examines 60 of the devious, deadly traps left behind by this mysterious civilization, with complete d20 stats for each.